2(Radiodiagnosisdepartments, Faculty of Medicine, ZagazigUniversity). 3Radiodiagnosisdepartments, Faculty of Medicine, ZagazigUniversity). Objective: To highlight the role of high resolution US (ultra sound) in diagnosis of hand and wrist lesions. 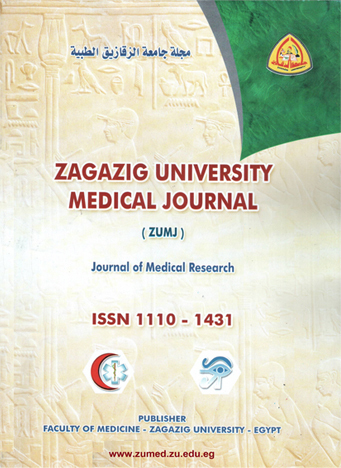 Materials And Methods: This study was performed at Radiology department, Zagazig university hospitals during the period from January 2011 to December 2015 .one hundred patients complaining of wrist or hand problem and fifteen normal volunteers subjects as control group were enrolled in the study and uponsuspected clinical diagnosisthey wear grouped into five groups. High resolution US was done for all cases and control subjects. Results following surgical evaluation or clinical and radiological follow up were compared with the US results. Sensitivity, specificity, PPV, NPV and accuracy were calculated. Results:Group A included 40 cases:Carpal tunnel syndrome (CTS) was detected in 20 patient, traumatic or post-operative nerve injury was presented in 20 cases, Majority of cases 10 cases (50%) showed complete chronic nerve cut with neuroma in continuity. Group B included 35 cases40% of the patients had complete tendon cut, 17.2 % had partial thickness tendon cut, 14.3% isolated tenosynovitis and 28.6 % had tendon entrapment. Group C included 10 cases with arthritis; Group D included 8 cases with hand or wrist mass, and group E included 7 cases with foreign body impaction. The sensitivity, specificity, PPV, NPV and accuracy of US examination in diagnosing different wrist and hand pathology in those groups were high reaching up to 100% in most of these pathologies exceptfor complete traumatic tendon cut the sensitivity, specificity, PPV, NPV and accuracy of ultrasound were 87.5%, 100%, 100%, 75% , 90%,for partial tendon cut were 100%, 87.5%, 66.7%, 100%, 90% , for the complete nerve injury were 100%,90.9%, 90% 100% , 95% and for partial nerve injury were 77.8 %, 100%, 100%, 84.6%, 90% respectively. Conclusions:Us has high sensitivity and specificity in detecting most of the hand and wrist pathology. It can be used for pre-operative planning.It is low cost and Lacking of ionizing radiation made it the first imaging modality for hand and wrist lesions.